PERM (first step in US green card process) approval processing timeline are for H1B (EB2, EB3) and L work visas applicants based on their ETA Form 9089 filing with DOL. USCIS does not process PERM. 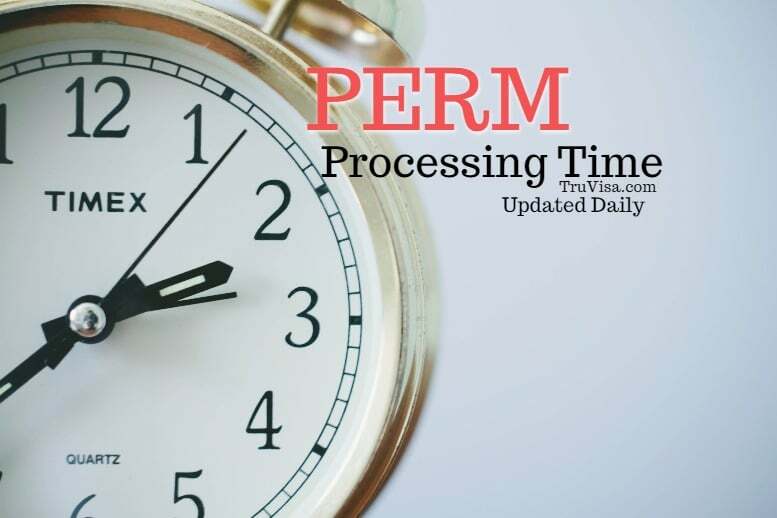 PERM labor certification (or LCA) processing time is updated daily using official data from department of labor and average PERM best case processing time is shown using various other user driven tracker (like trackkit) forums online. How long does PERM approval process can take in not in your hand but you can file H1B 7th year extension (after completing 6 year quota) with PERM pending > 365 days including Audit time. Use PERM experience letter sample to get skills listed on old employer’s letter head as an employment verification. This may be needed to prove your skills for the job description that is relevant for your PERM application, if your case is selected for PERM Auditing. The letter also explains how to write job description for PERM. Normally, 30% of PERM applications are selected randomly for Audit. PERM applied in H1B 6th year. Can H1B be extended? You cannot apply for H1B 7th year extension unless your PERM gets approved before your 6th year ends if you apply PERM during 6th year. PERM has to be either approved or pending (waiting) for more than 365 days on the last day of H1B 6th year. As a solution to this problem, attorney’s suggest to re-capture vacation time spent outside USA and extend your 6th year end date. More PERM questions and reliable answers on TruVisa.com. There is no premium processing available for PERM application. i140 application has premium option though. Check current i140 processing time. If your application was filed more than 3 months prior to the date posted (raise SR) above, you may contact DOL Helpdesk for a status on the application at plc.atlanta@dol.gov. 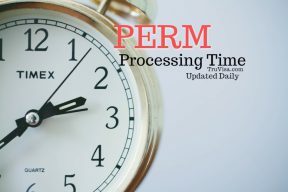 Is the 11 Jan, 19 date for PERM processing correct? These dates are reported by users. The chances are good that they are correct. PERM processing time is returning to an all-time low. 1. When my perm will get approved? 2.can I travel to India in August 1st and come back on Oct 15 so I will get 2.5+1 (3.5)month to get extension on recapture grid?. 3. Do I need to come back from India before my visa expires? Please use the dates given above to estimate your PERM approval time. You can travel to India and use your time spent outside USA to move your max out date even further. You would need a valid visa to enter USA. It is your choice if you want to enter before it expires or wait. If you wait for your visa to expire, you will need an approved H1B petition to get a new visa stamp. Hello Anil, My perm email approval got on 29 march 2019 . My H1B 6 year max out date is 22 April 2019 .Planning to apply I 140 in premium, but we have not received paper copy of perm.How much time it takes to receive perm paper copy ? I am in Michigan. Second question is if i have not received paper copy by 22 April 2019 i will go to India .Then how to sign paper perm copy from India so that attorney will file I 140 . Your employer is already doing things on the edge wothwit leaving any scope for contingencies. PERM approval can take 7-21 days to arrive. If there is any signing required, then they will off course have to mail it to you. Have you re-captured your vacation time? Hello Anil , just got PERM paper copy and they planned to file I 140 in PP on 10 April 2019 .Now question – do you think its possible to get I140 approval + paper copy of I 140 + applying H1B 7th year extension before 22 April 2019 . No vacation in last 6 years .So do not have re captured vacation .Thanks. As I already told that this is very tight timeline. I do not what will happen. By filing i140 on April 10, 2019, your employer is already banking on the assumption that you will get i140 approval within 10 days. our perm was filed jan 11 2019, when can we expect the result? I am stopping giving estimates from today. Please use the estimated dates above to get an idea about when you can expect your case approval. You can expect your PWD approval by April 2019 end. You have enough time to get i140 approval. My pwd was filled on Nov 14. Looks like December cases are running. Should I wait for some more time or contact to the lawyer. Still I didn’t see any update..Still November cases results are coming or almost every one got the approval? We still have time left in April 2019. Is there any portal to check for the Perm case status approval ? Mine is submitted on Dec 15 for Perm approval. Still waiting for the update. Only your employer can check the PERM status. Ok. Thank you Anil ! December 27 cases are running now.still not getting perm did you get yours? Sorry I just read your message.same situation mine. Is pwd processing time takes longer than before because mine is 6 months and didnt hear anything from my lawyer. Is only mine takes a longer time or what? I m just worried about it so. Your PWD is taking longer than most applications. So what should i do in this case? Ask your employer to check case status with DOL. Hello. What was your pwd application date? Mine is 20 Nov.
hi, Sorry if asking in wrong forum, I have a question as to revocation of perm after 180 days, this 180 days start from which date, the priority date or the i140 approval date? PERM is valid only for 180 days. It automatically expires. Why would anybody withdraw it? Sorry I meant the revocation of i140, if you switch employer, then I guess its advisable to stay with the older company for 180 days atleast to retain the priority date, my question was regarding that. This 180 days start from which date. the priority date or the i140 approval date. 180 days for i140 start from i140 approval date. Hi Anil. Thanks for updating this tracker. I have 2 question. 1- My Prevailing Wage Determination(PWD) application was sent on 19 Nov. When would be an anticipated date to get a reply from DOL? 2- I noticed that the Best Case Approval Date has moved back from 16 Nov to 12 Nov. How to read this date? Thanks. The date moves back when our service deletes a bad record which it cannot reliably verify. You are pretty close to getting your PWD approval.